It was a great day for the GeorgeCo BMW powered by Beano. The weather was perfect and the course challenging and fast. The CDC runs an index system based on weight, horsepower, and tire. We’re running a street tire to try to be competitive on index time. We’ll see if it works. The car is really running well and all traces of the drive-line shutter are gone. 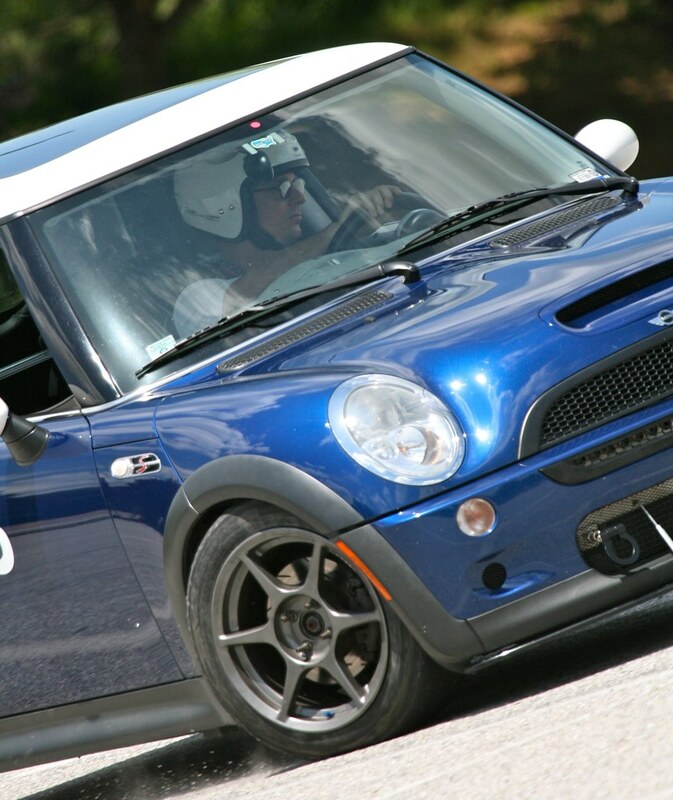 Busy weekend for autocross. After a month off — back in with both feet. Yesterday it was a sweltering event with the CDC, and today it’s back to FEDEX Field for the SCCA event. The GeorgeCo MINI powered by Beano ran well yesterday. All four runs were within .sec of each other. 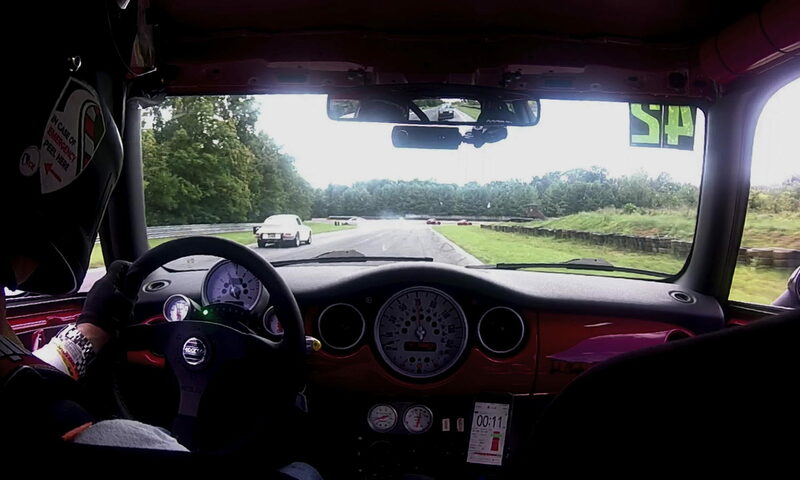 We had the fastest MINI at the time we left. Today the team is hoping for a solid mid-field placement in Street Mod. It looks like rain so perhaps we might do even better. Start your rain dance. The rain dance almost worked. The event Sunday was delayed two hours. When it finally picked up again, we only got 3 runs each. I opted for the RA1s over the slicks today. It was almost the perfect choice. Almost, because by the time Street Mod ran, we had an almost dry course. Grip was good, but not great. I think I was mid pack again, but with a fast group so that’s OK.
You can see from the photos above that the course was quite dusty. It started with a clockwise half-loop into half a figure-eight and another half-loop into a short slalom. Across the top of the parking lot through as series of tightly spaced off-set gates with a quick right-left-right-left, followed by a loop to the finish. You sort of get a feel for it from the video, but the camera mount is too low to see the cones. I’ll have to figure out another way to mount the camera in the future. Thanks to the CDC group photo pool for the photos of my car. I also posted a bunch of photos from heats 1 and 3 to the pool as well. On Saturday I finally made it to a CDC autocross event. 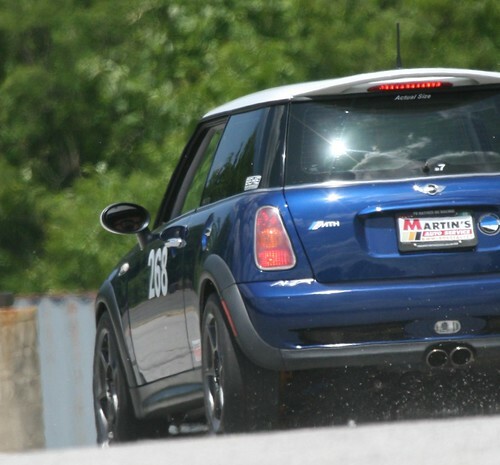 This one was held at the Triple Skid Pad at Summit Point — same place as the BMW Club event, only this one wasn’t a sogfest. BSR has finally paved the aprons around the inside of each skid pad and cut-out, but the infield is still very soggy. The course was fairly simple, but because of the lack of grip, was actually quite challenging. 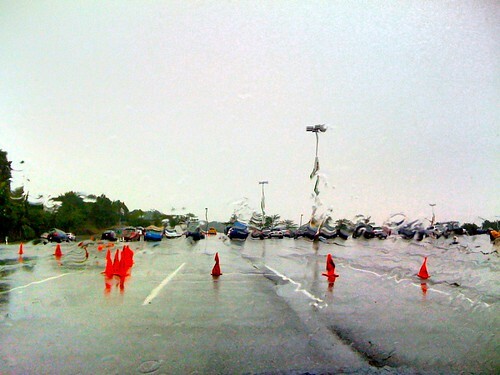 I wasn’t sure if it was going to be wet so I took both the RA1s and the Hankook slicks. I ran the morning runs with the RA1s and then the slicks in the afternoon. Right off the bat, the slicks were 3 seconds faster and ended up being almost 5 seconds faster. The video is from the last run. I still haven’t fixed the audio, so you want to turn down the volume. The results aren’t posted yet, but I suspect the winner was in the low 47 second range. I’m hoping for a top ten finish. My best was in the high 48s. As a comparison, my best on the RA1s was in the low 53s. I probably should have heat-cycled the Hankooks before running them last month at the first SCCA event. They really had much more grip this time, even on the slick surface. I think they are going to work out well this year and seem to be wearing fairly evenly so far. The only down side was the poor fellow driver in the Lotus Elise who went off into the mud only to turn up a 30-pound rock with his front splitter. With a large “whack”, bits of carbon-fiber were flying everywhere. I’ve been told the only way to make repairs is to buy a new clam shell for the front half of the car. That’s an expensive weekend. Since the F-22 isn’t yet registered, I decided to run the MINI at the CDC autocross today. The morning started out quite wet, with a light drizzle falling most of the early morning. Since I was running in the third heat, I took a chance and switched to the R comps, which was the right choice. My morning runs were in the mid 42 second range, with my best run of 42.02 coming after lunch. It seemed like most of the runners were in the 44-47 range, with only the Cobras below 41. The car felt really well balanced, even if 3 runs wasn’t quite enough to get the required amount of heat into the tires. They continue to wear well. I just bought a set of spacers so hopefully they will fit on the BMW as well.